We have it available at the shop, and online. A great tour-de-force of modern-pop-history! Celebrating its 40th anniversary this year, Rolling Stone stoked the imagination of America's social revolutionaries and fueled the careers of brilliant writers like Tom Wolfe, Hunter S. Thompson, Joe Klein, Cameron Crowe, P.J. O'Rourke and visionary photographers including Annie Leibovitz, Mark Seliger and Baron Wolman. Rolling Stone Cover to Cover is a backstage pass to four decades of popular culture--a DVD ROM-based, searchable digital archive of every issue of Rolling Stone magazine from 1967 to 2007. Browse issues 1 through 1026 – over 98,000 searchable pages, exactly as they first appeared in print--every story, review, interview and even every ad. 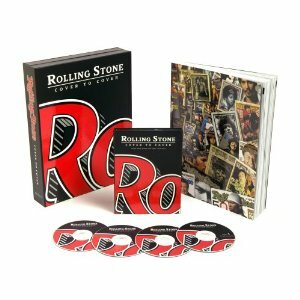 This exclusive box set also comes with a photo-filled, 208–page page companion coffee table book providing a vivid behind-the-scenes look at the magazines history, from birth to today and includes a bonus one-year subscription to Rolling Stone (a $12.95 value). See certificate inside package for offer and rebate details. The product includes the Bondi Reader, powerful MAC or PC browsing software that allows you to explore, search and view every page, and to arrange and save multiple reading lists. The ultimate pop culture reference tool, this essential collection is a must-have for all music fans, political junkies, nostalgia buffs and collectors.